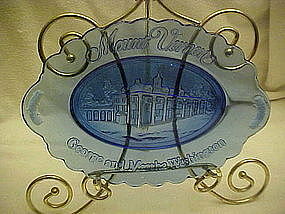 Pretty oval platter made by Avon in the Mount Vernon, George and Martha Washington pattern. Pretty cobalt blue color with Mount Vernon in the center. Oval shape measures 6 3/4" x 9 1/4". Great size for a salad. Perfect condition. I have other pieces in this pattern listed. Picture shows color twice lighter than it actually is.